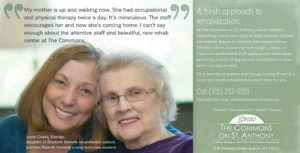 How do you increase referrals 80% for rehabilitation, 36% for long term care in eight months? The answer, careful planning. A newly renovated skilled nursing facility in Auburn, New York opens in 2014 and expands a year later with 80 more beds for short-term rehabilitation. 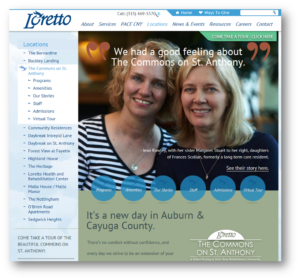 This is a unique marketing challenge as The Commons on St. Anthony, a part of the Loretto family of senior living services, is the coming together of the Mercy Health and Rehabilitation Center and Cayuga County Nursing Home, both of which closed for different reasons. There is much confusion in the community about those closures and then the merger with Loretto. Awareness for the new name is low. The new facility is physically located on the former Mercy site and the community refers to it as Mercy. Strong competition. Within a small community, there are two other primary competitors, one is part of Auburn Community Hospital where most referrals are derived. 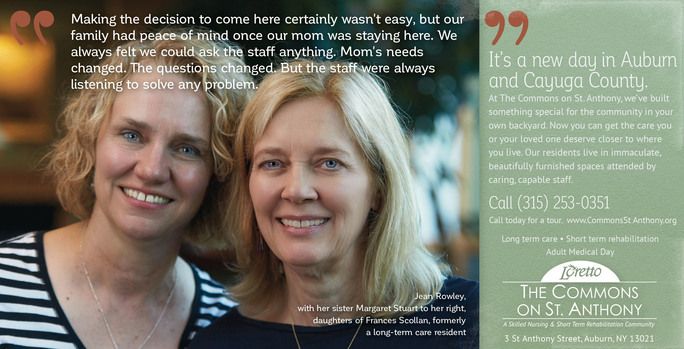 The quality of care at The Commons is superior, kind, and compassionate, but relying on word-of-mouth is not going to be enough to increase admissions fast enough. The renovated facility itself is a competitive advantage but more need to see it. Develop a comprehensive referral marketing program that informs physicians, social workers, discharge planners at area hospitals, healthcare support agencies of our unique offering. Hold events at The Commons for referrers and consumers so that they can see the brand new facility. Long term care admissions has risen to the point where additional beds have been added. Comparing August to October, 2015 v. 2016 referrals, we’ve experienced a steady climb from 25% to 77%. The census goal for The Commons has been reached. The advertising is well received and families that are featured are pleased to be part of it. Best of all, website visits are up 32% YOY.